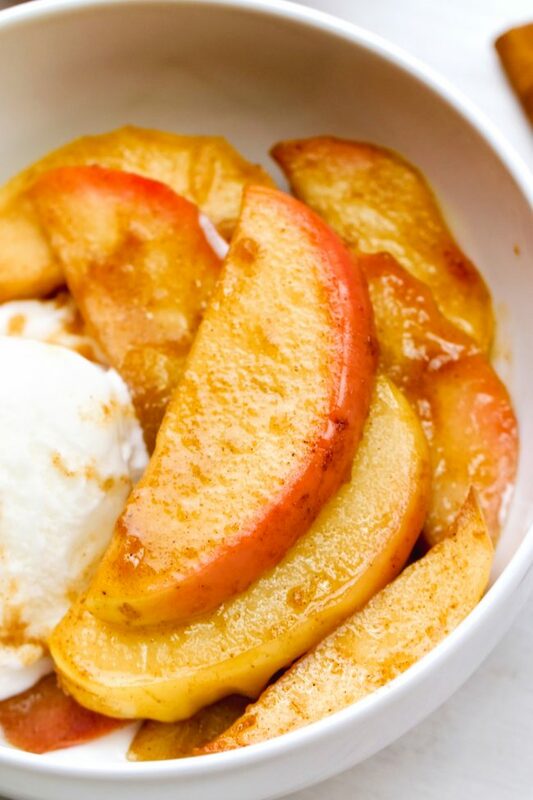 These sauteed apples are lightly sweetened with maple syrup and are quick and easy to prepare! 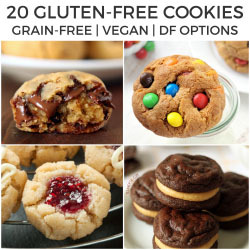 They’re also gluten-free, vegan, paleo and dairy-free. I know sauteed apples aren’t the most exciting or most popular Thanksgiving side dish, but I’m always happy when I see them on the table. If you’re looking for some more standard recipes, try this gluten-free vegan cornbread or my cranberry sauce with orange juice. I absolutely love sauteed apples but I don’t love how sugary and gloppy they are. Yuck. I want to taste the apples and not a bunch of sugar. These sauteed apples only use 1 tablespoon of maple syrup per serving (which according to my love of cinnamon apples, is a generous 1 apple per person!) But if we’re being realistic, and this is being served at Thanksgiving, I bet this recipe would be enough for 8 people. I did want the slightly molasses-y taste that brown sugar adds, so I added a teaspoon of molasses to the apples. It was just enough! You can omit it if you don’t have any on hand. I used Elstar apples, which are really common over here in Germany, but I think any sweet apple would do. Except Red Delicious, because like I’ve said before in this apple butter post, those are basically useless. Do note that if you use a tart apple, your sauteed apples are going to be tart because there’s not very much sweetener in this recipe. You can also add more spices like nutmeg, allspice, and cloves – or just make it simple and add apple pie spice to taste. I didn’t add any more spice because Mr. Texanerin is very picky when it comes to fall spices, but he’s always down for cinnamon. I wanted some help eating these so I made them Mr. T friendly. 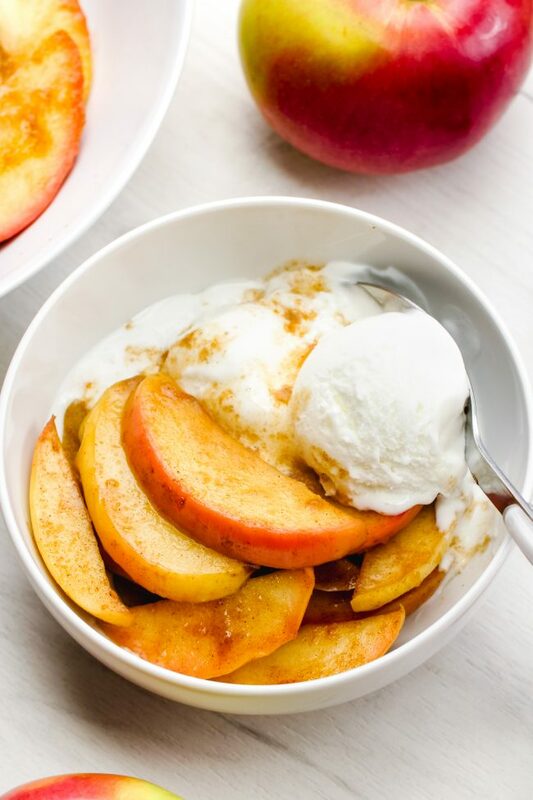 And these cinnamon apples fit pretty much every diet! They’re naturally paleo, gluten-free, dairy-free, and vegan. I used coconut oil just because I like coconut oil, but you could also use regular butter if you prefer. Bring these to Thanksgiving dinner and everyone will be able to enjoy them! What sides are you all making this year for Thanksgiving? I like this sweet potato mac and cheese for something a little different and this gluten-free cornbread. And if you’ve never made cranberry sauce before, be sure to check out this post on how to make cranberry sauce! It’s so very easy. I’m not going to start regularly sharing Björn photos but I just had to share this one! 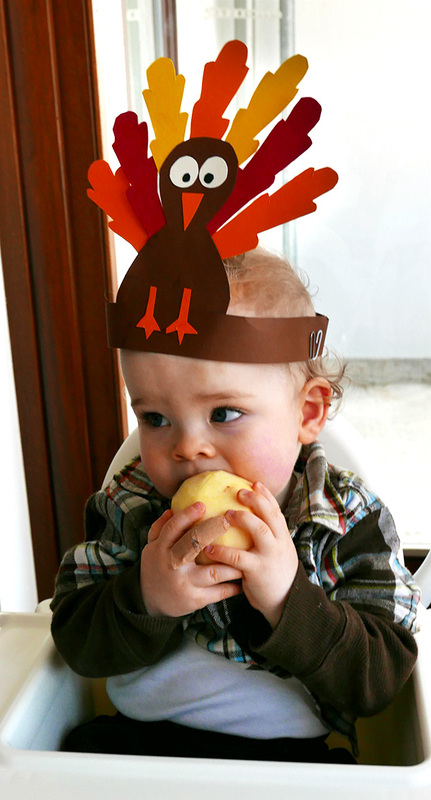 We celebrated Thanksgiving a little early this year while my parents were visiting and loved this little turkey hat. Here’s where I got the pattern. We wish you a wonderful Thanksgiving (or a great Thursday if you’re not in the US!). In a large pan over medium heat, mix together the first four ingredients (coconut oil through cinnamon). Once the oil is melted, add the apples and mix to cover the apples thoroughly in the liquid mixture. Cover and simmer the apples for 7 – 15 minutes or until the apples are soft enough for your liking. Add in the vanilla and stir. Remove the apples from the heat and let them sit for 10 minutes and then serve. The liquid will gel a little as it cools. Can also be served at room temperature. Store the leftovers in an airtight container in the refrigerator for up to 5 days. I used refined coconut oil, which has no coconut oil taste. If you use unrefined coconut oil (which does have a coconut taste), these sauteed apples might have a slight coconut taste to them. 22 comments on “Sauteed Apples (naturally vegan, paleo, gluten-free)” — Add one! I adore apple-y goods! 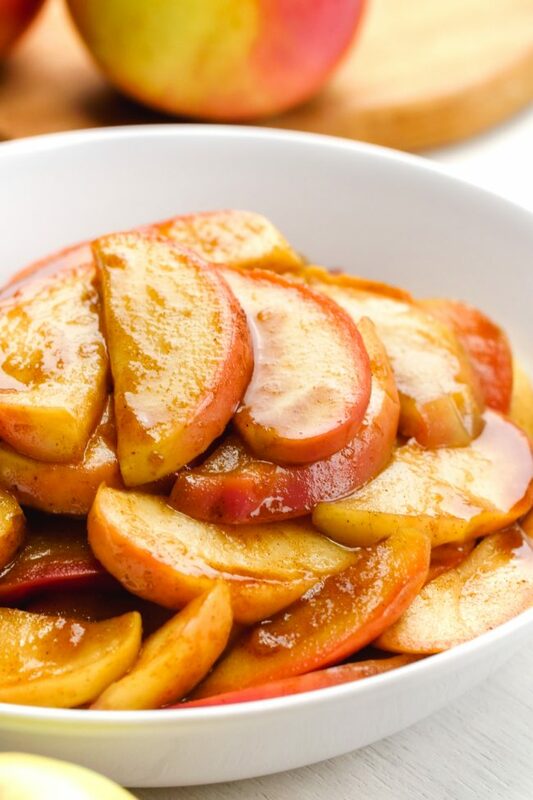 Apples with warm spices are just heavenly. Nice addition with the molasses here, too! I could seriously eat this all year round. I *AM* always excited to see an apple dish like this! I love them paired with savory dishes, and I just may make them for our holiday dinners this year! Hmm it looks delicious!! And what is the white cream on the picture? Ice cream .. cream cheese? It looks delicious !! Thank you! :) It’s vanilla ice cream. So yummy with these apples! 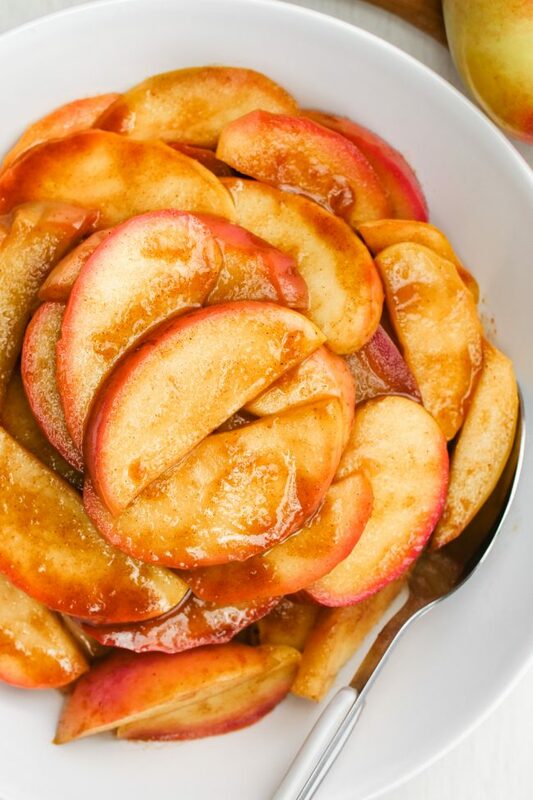 I forget about sauteed apples, but these look so easy and delicious!!! I’ll have to make these – and don’t think I’m skipping out on the ice cream on top either, lol! Haha. Always good to know with the ice cream! This looks delightful! 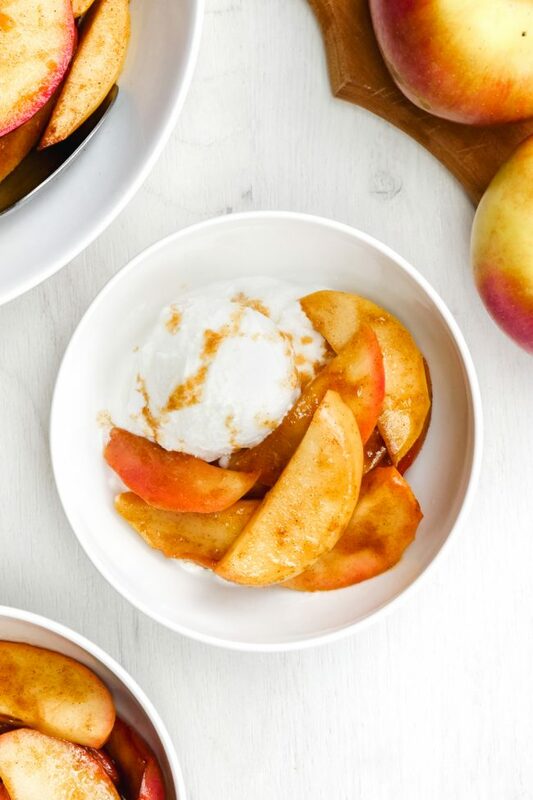 We all love apples around here and I WILL be making this sometime this fall – YUM! I hope you’ll enjoy it as much as we do! I have made these a number of times and they have been great every time! Everyone in my house loves them, with pancakes,crepes, pork tenderloin or even alone. They are so good, everyone should try them! Thanks for your sharing and Happy Thanksgiving!! I just love sauteed apples, but forget to make them. And I have a whole bag of apples on hand! I need to get on this. YUM!! I am a cinnamon apples person myself. No other spices needed for me. What a cute pic of your little one. He is such a cutie. Sounds simple enough. My husband is forever bringing home ice cream, pies, cookies. I’m always tempted and give in. I should have on hand something for me that doesn’t scream guilt.